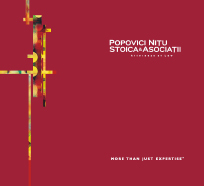 First and foremost, Popovici Nițu Stoica & Asociații is a team. The team brings together strong local capabilities, with exceptional credentials, outstanding records and distinguished careers in law, business and academia. Almost all of Popovici Nițu Stoica & Asociații team members have completed a double education with local and international schools of law from Washington to Paris, from Rome to Geneva and have handled legal assignments in collaboration with international law firms. Core team members include only partners, managing and senior associates, and the associates who have followed a minimum 2-year apprentice stage with the Firm. Be invited to discover our core team and their legal experience. "As our People make us different, we offer more than just expertise."